Please book the rooms direct by the hotel. Saturday, 26. und sunday, 27. November 2016. The international meeting has been organized by the Babolna National Stud, by ISG Shagya Arabion Society International and MALE; Society of the breeders of Arabian Horses, Hungary. The Invitation incluse program, hotel-list and Pre-Registration. The National Stud Farm "Babolna" is celebrating 225 years existance. There an international Championship for Shagya Arabs and a ECAHO-C show for purbreed Arabians. 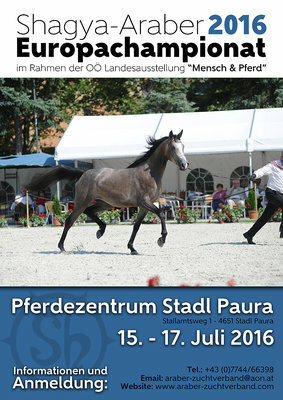 Registration directly at the "Pferdezentrum Stadl Paura"